Good morning! Just a quick drive-by post today as we're heading out to Disneyland in just a little bit. 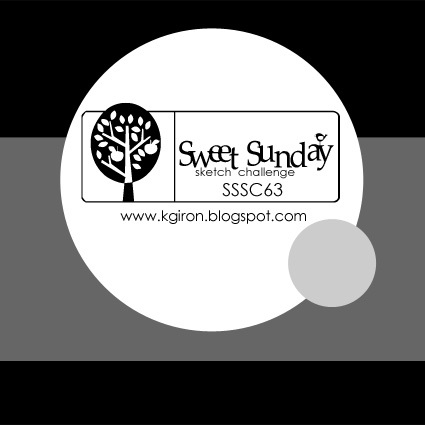 But I just had to get my card for Karen's Sweet Sunday Sketch submitted. I pulled out a color combo I used a few months pack on another card (loving this combo more and more! ), and whipped it out. I couldn't figure out where to put a bow without overwhelming the card, so a little strip of ribbon had to do. Great card, Kristina!! Lovely bright colour combo and there is that fabulous PTI leaf image again! What a pretty color combo! Loving those buttons too!